Carbon monoxide, Nitrogen dioxide, Hydrogen, Ammonia, Ethanol, Methane, Propane, Iso-Butane, Ozone, Sulfur Dioxide, Carbon Dioxide. These gases are common air pollutants that are unsafe and potentially fatal beyond certain concentrations. Particles from 10 micrometers in size (P10) all the way to fine particles up to 2.5 micrometers (P2.5). Most air around us has very small amounts of tiny particles, but when these particles occur in larger concentrations, they can lead to irritation and serious respiratory illnesses. Temperature, humidity, barometric pressure, solar radiation, and noise level. These environmental factors are key to defining an area’s air quality. 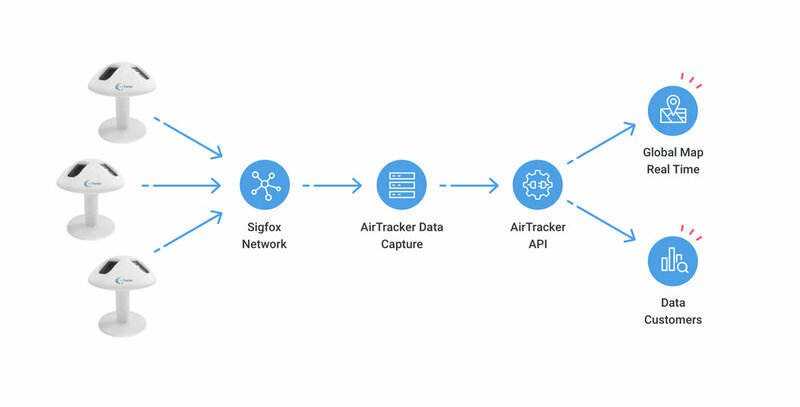 AirTracker’s connectivity is provided through the SigFox network. Sigfox is the world’s leading provider of connectivity for the Internet of Things (IoT). It has built a global network to connect billions of devices to the Internet while consuming as little energy as possible, as simply as possible. Sigfox’s unique approach to device-to-cloud communications addresses the three greatest barriers to global IoT adoption: cost, energy consumption, and global scalability. This technology allows each AirTracker unit to be more affordable to make, and also, to operate for up to 28 days without daylight to charge its solar powered batteries.